Discussion in 'Cross Country, All Mountain & Trail Riding' started by James, Nov 19, 2005. Just got it finished last night! This is actually my 2nd Giant SS frame, but when I had the first one, I lived down south more, and had some knee issues, so I really couldn't ride it anywhere. Not enough "rolling" type hills. But now, oh it's on baby! Giant Two2One frame, Pea soup/baby poo green. Duke SL with Motion Control, 3" travel, ti brake studs. Thomson X4 stem, which I'm gonna swap for an EA70 as the Thomson is just waaaaay too high of a rise, I feel like I have ape hangers on there! Easton EC70 oversize riser bar, which I need to cut about .75" off of each side of. I'm used to 25" bars, they're on all of my other bikes, and these tend to sweep up a bit more than I'm used to. Race Face Deus cranks, originally black, but since mine were one of the first runs off of the line, they had the bad ano job, so they're really more of a purple at this point, c'est la vie. 32t/16t gearing. I plan to swap out the RF ring for a dedicated SS ring, without any shift ramps. WTB Laser XC wheels, shimmed down to 1 Shimano DX 16t cog. Avid SD Ti brakes, ti hardware. SRAM 9.0SL levers, I love 'em, but they're a bit too flexy for anything but my SS. I have like 4 sets of these damned things, 2 more still in the boxes, so I've been trying to find uses for them. Another set on my CX/Commuter bike. Crank Bros stainless EggBeaters, I love 'em. EA70 post, and a WTB Laser V seat with Ti rails about sums it up. Oh yeah, oops, Vredstein Tiger Claw tires in 2" width. We didn't have the 2.35" in yet, but they'll be on there as soon as we do. These tires remind me a lot of the Hutchinson Pythons, similar ideas, low tread, fast rolling, but not an "all mountain" tire. Perfect for my SS though! Anyway, what do you guys think? I can't really think of anything I want to swap out on it, save the stem, and cutting down the bars. I would like to eventually get a "real" SS wheelset built up, with like a Paul or Phil Wood, or Spot hub at some point, but this bike was built on the CHEAP. Edit: how do I get the picture to show up in the message? For the pics to work, highlight the address in the "IMG" box on your Photobucket album page. Copy, then paste it here. Ah, thanks. I'm a freakin' n00b. Great color! How do you figure that Thompson has too much rise? Looks like it has negative rise as it is. Maybe it has too little? Oh, I had it built with the stem the "right" side up, and felt like they were ape hangers, so I inverted it before I took the pic. I really like the color too. Thinking I might swap the Duke lower for a white one, I think it'll match the pea green really well. cool. 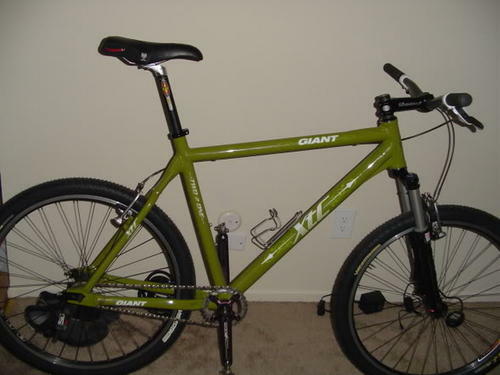 I did not know giant had a SS frame. i guess their not imported in to canada.